Today I discovered beauty in a bottle, of such colour one can not imagine. Costing a mere pound, this may just be my bargain of the month. And my gosh, do I love it. 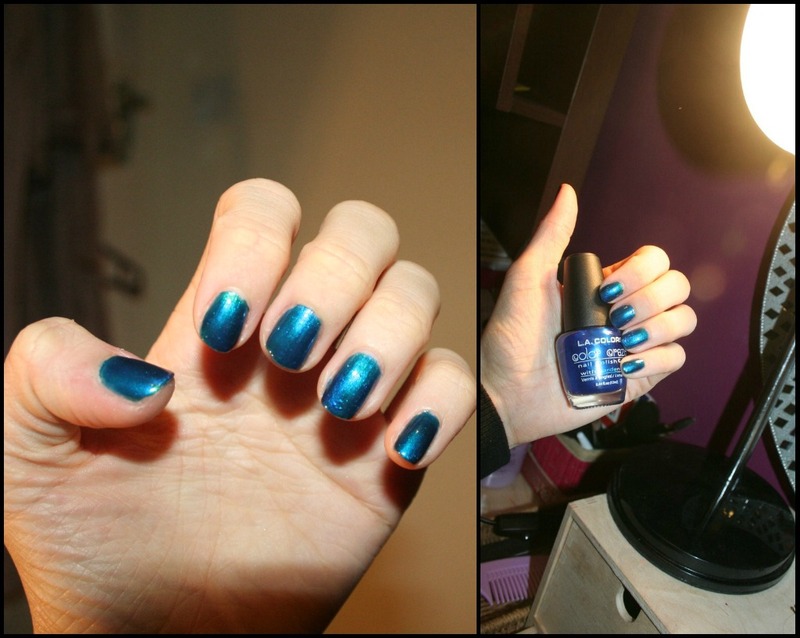 A shimmery dark blue colour that can appear a lighter shade of blue in certain lights. It isn't as dark as Barry M Navy, and I would say is the blue equivalent to Models Own Peacock Green. Definitely one of my favourite nail polishes: although slightly dark for spring, I'm using the cold weather in England as a wintery excuse to wear it. One thing I'm noticing is a connection between the names of LA Colours nailpolishes I have recently bought: I think they might have an informal collection or something as I'm noticing a vivid connection between the names 'Wired', 'Voltage' (top coat), 'Energy Source' (plain white), 'Power Outage' (shimmery raspberry with pink duochrome) and 'Nuclear Energy' (plain mid-purple). Have you had any purchases recently that made you feel happy? I really like this range of nail varnish! I have some lovely glittery colours!